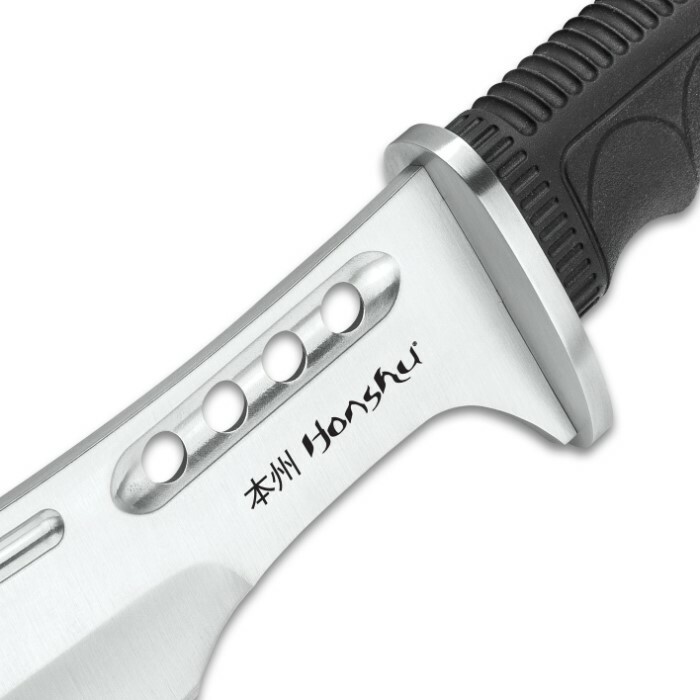 Honshu Boshin Parang With Leather Belt Sheath - 7Cr13 Stainless Steel Blade, Thru-Holes, Molded TPR Handle, Lanyard Hole - Length 19 1/2” | BUDK.com - Knives & Swords At The Lowest Prices! 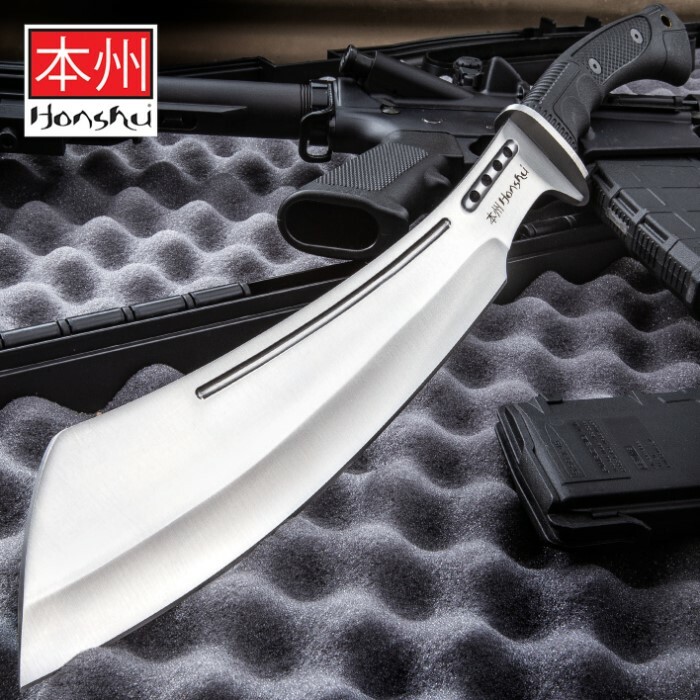 United Cutlery continues to expand its most sought after Honshu line of modern, tactical weapons and, now, the Honshu Boshin Parang has been added to the family. As with the popular Boshin Kukri and Bowie Knife before it, the parang retains its time-tested blade form, bolstering it with resilient, modern 7Cr13 stainless steel and rock-solid full-tang construction. Thru-holes, a menacing blood groove and a brilliant satin finish add contemporary tactical flair. 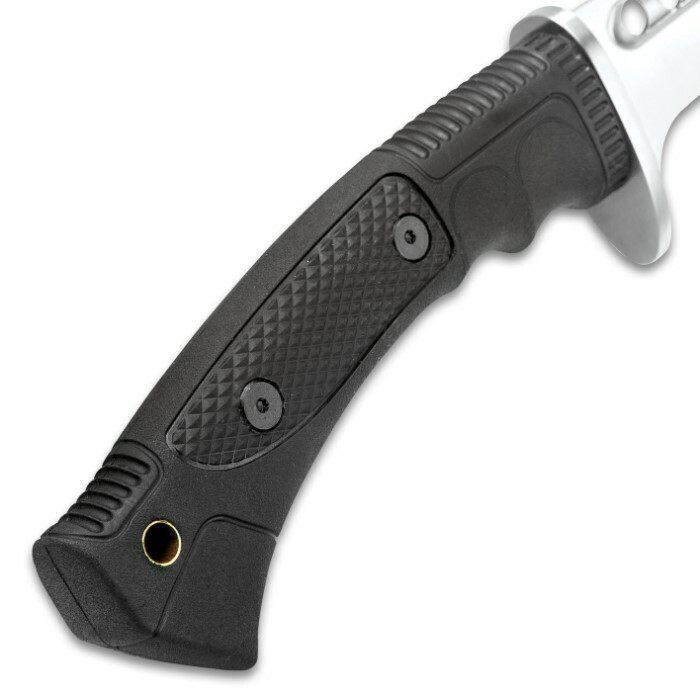 Made of state-of-the-art TPR, the Boshin’s handle is rugged and waterproof. Ergonomic contours and texture provide a slip-free bond with the hand, reducing fatigue and improving control. This, along with flawless balance, gives the parang an overall feel that defies description. Try the Boshin Parang just once, and you’ll never settle for another machete. Like all the swords and knives in Honshu’s Boshin line, it sets a new standard for both quality and value. Have bought many machetes over the years and this is by far the best one. Excellent design makes it well balanced and easy to swing with enough weight to chop through small trees, thick branches, brush etc. Well worth the money will be buying another one.